Posted on October 31, 2016 at 11:21 am. Forget Taylor Swift’s squad, you can now be a part of Guts online casino’s new loyalty program and reap the rewards. Guts online casino were late to the loyalty program party, but regular players can now earn special rewards by playing at the fast withdrawal site. What’s more, both new and older players are eligible. 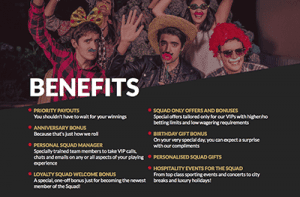 If you’re already a member of Guts online casino and believe you’ve met this criteria you can email [email protected] and the team will assess whether you’re a contender for the squad. Only real cash wagers are taken into account – so if you do take advantage of the $400 welcome bonus this extra cash added to your account doesn’t count. Additionally, be sure to enter a valid number and email address of the Squad leaders won’t be able to contact you to join the team. To find out more, head to Guts Casino and read the terms and conditions on the Guts Squad page. If you then want to join the team, register your details and open an account to get playing and earn squad status at one of the best Internet casinos around. Alternatively, if you are reading this from United States and Guts doesn’t tickle your fancy, you can also join similar online casino rewards programs and play the latest real money game releases at Raging Bull Casino.